Blah Blah Bklyn: Is OneTouch being a little paranoid? Is OneTouch being a little paranoid? Did anyone else get this flyer in the mail? "Don't be fooled by other brands asking you to switch...You don't need to switch." 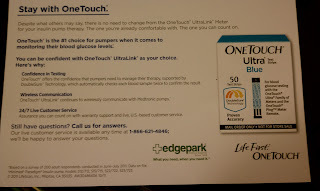 "Stay with OneTouch: Despite what others may say, there is no need to change from the OneTouch UltraLink Meter for your insulin pump therapy..."
I got it from Edgepark yesterday, and I couldn't help but wonder what prompted it. 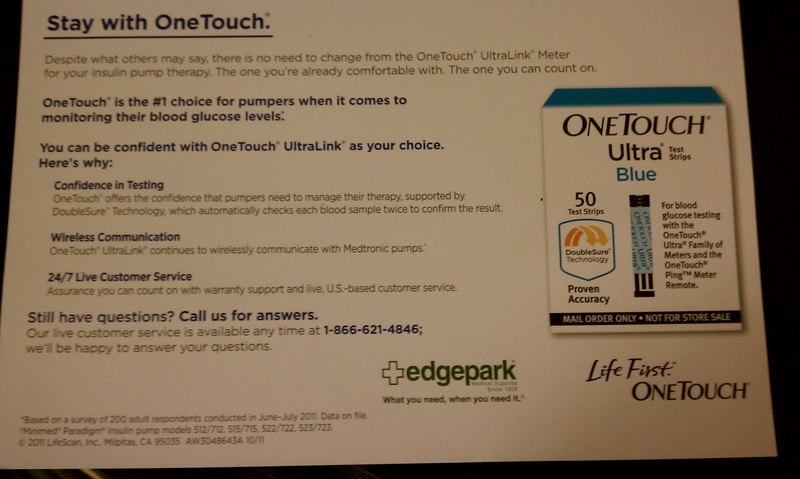 Could it be as simple as LifeScan knowing it'll be a problem that the Medtronic exclusivity deal has ended? (And by "problem" I mean "major loss of revenue.") 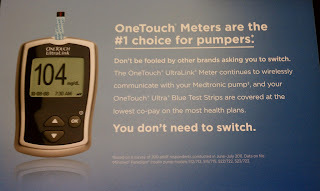 Last I heard, Minimed was still the dominant pump on the market, and that's a lot of people buying strips. I can't for the life of me remember what the new partnership is. Bayer maybe? When I'd first read about it, I did have a "Hmm...maybe I should check that out!" reaction. I'm sure I'm not the only one. Good luck with that, LifeScan. I find the whole "You don't need to switch" headline really creepy and paternalistic. Just me? Ok, I'm WAAAAY late to replying (just catching up on your blog - SORRY!). A lot of people's insurance companies are telling them they need to switch to another brand because of a range of things, whether they simply aren't covering them anymore or they want you to use a cheaper brand, and the other strip companies have taken notice and are pushing their products harder as well. Basically saying, "Hey, your insurance may not continue to cover your strips, so go ahead and switch over to us!" sorta thing. But my thinking is if they cover them and you like them, there is no reason to switch.